Friends, I have a December birthday. It’s December 13th. And every year, my mom would do pretty much whatever I wanted to make my birthday special, and make sure it didn’t get lost in the midst of the Christmas hustle and bustle. (Thanks, Mom!) That included many things, but most importantly always, always making sure to wrap my birthday presents in birthday wrapping paper. My number one, biggest ever pet peeve? Getting a present on my birthday that’s wrapped in Christmas paper or in a Christmas bag. You know what the grocery stores and drug stores all sell year-round? Regular, plain ol’ paper and bags. Even if it’s a solid color! Just not a teddy bear in a Santa hat holding tinsel. Come on, guys. I think one great thing I always got to do was choose whether or not I wanted the Christmas decorations to be up yet. I went back and forth pretty much every year about whether I wanted them up. Sometimes, it felt too rushed to have them up already – I mean, the first two weeks of December were about my birthday, right? But other times, it made the occasion even more festive to have everything decorated and lit up! Most important part: the choice being mine. Another really wonderful thing my mom did was let me have a party. It must’ve taken some planning, too, to get the decorations and favors and treats that weren’t Christmas-themed. Usually, all I wanted was a ridiculous number of my friends over to spend the night (aka not sleep) but she still let me do it, even though we were always horribly busy (read: we were musicians), already exhausted, and there were already a thousand other parties happening that month. She was a champ, let me tell you, with my room right over hers, full of dancing, singing, giggling girls, playing weird games and calling boys on the phone all through the night, and still making us all pancakes in the morning. I’m sure lots of things she did were just regular moms-doing-nice-things-on-birthdays stuff. But it really made me feel special in the midst of a season that is (thankfully!) not about me. The season of advent can be celebratory, but it can also be contemplative and somber. 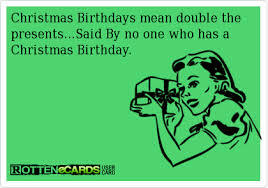 Not losing sight of the birthday celebration in the midst of that will make a December birthday feel special. So bottom line, thanks Mom, for not wrapping my birthday presents in Christmas paper. Not one time. You’re the best!